Freedom | You Can Shake the Gates! Freedom – You Can Shake the Gates! What must we fear if we have died with him? We have victory over death through Jesus Christ: the sting of death is removed and is not the bitter pill it once was. We are no longer obligated to slavishly obey every whim of our bodies–whether that be lust or gluttony or laziness or gossip or fear or arrogance . . . We are free! Why share these thoughts in a prayer update? Believer, you must understand that Jesus has made a spectacle of these spiritual forces when He walked out of the grave. He rules at the right hand of Almighty God, riding the white horse to victory, treading out the winepress of the fury of the wrath of God. We are sent forth in the name, authority, and majesty of Jesus Christ not to kill and destroy and subdue, but to conquer evil in love, purity, and spiritual power. When you pray in alignment with the Father’s heart, you are wrestling against echelons of evil, arrayed in the whole armor of God, marching to victory. We together must pray, must call upon the name of the Lord, must leap into the fray in the name of Jesus Christ the Risen One and shake the gates of hell in Jesus’ name! Thank God for imbuing us with the power of the Holy Spirit to overcome sin and death in Jesus’ name. Thank God for His compassion and longsuffering patience with the nations; that He has provided a means for them to come into relationship with Him. Thank God for calling us out of darkness into His wonderful light. Pray that there will be unity across ethnic boundaries–that Christians of different people groups will work together in Jesus’ name and for his glory. 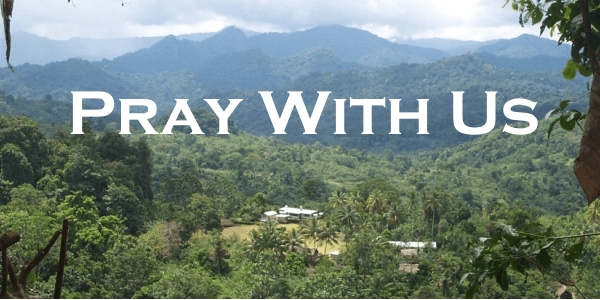 Pray that expatriate missionaries will exercise great wisdom and discernment in serving both Jesus and the peoples of Papua New Guinea–that God’s word will be made accessible to all. Pray that the Father will protect and provide for the teams that are intensely involved in the Bible translation ministry. Mount your white horses, take up the weapons of your warfare, and fearlessly bring the battle right to the gates of hell! If our dreams are intensely personal, they are also intensely fragile. But whisper a dream and the whisp might snuff it out. Our dreams are choked by the weeds of life: health or sickness, good relationships or bad ones, opportunity or lack, that which we can control and that which we cannot. Our dreams are intensely fragile. His dream–singular, piercing, soul-wrenching, awe-inspiring–is woven with different fabric. His dream evades capture, overcomes obstacle, penetrates enemy territory and liberates the heart of man, freeing it from enslavement to sin and self, offering life and love, even power, in its place. His dream is revealed little by little from the earliest syllables of Genesis through to the end of the Book. In that day, man in all his variety and uniqueness, will be represented before the throne–praising God for salvation. Not for money or ease or convenience or entertainment. For salvation. His dream pierces my right to be selfishly indulgent. His dream rips me from my excuses and forces me to consider the 6,877 languages and language groups of the world. His dream fixes my gaze on today’s 209 million people speaking 1,967 languages that do not have adequate access to the Bible in a language that speaks to them. If only His dream allowed me to look at faceless masses representing vast numbers of people–then I could ignore it, overwhelmed by the size of the group–but NO!!! His dream paints familiar faces on the canvas of my mind. This canvas is alive. These faces are tribal people, uttering exotic words in the mountain jungle where they live. They are our friends with whom we’ve had many adventures, joys and sorrows, victories and losses. They are our loved ones with names like Lim and Torenimas and Natika. The are people without the Bible in their heart language. They grow the coffee you drink in the morning and the chocolate you eat at Christmas. They cultivate vanilla which goes in all those wonderful holiday treats. They are people that God dreams of standing around His throne–wearing white robes, clean before his eyes. Their eyes are fixed on the Savior, on the throne, on Him. 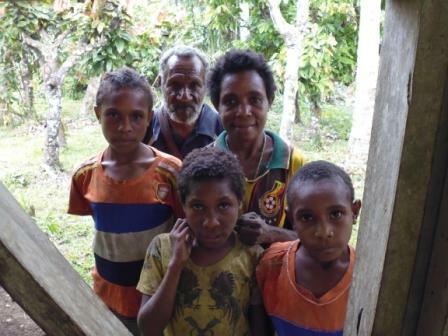 Close friends from Uria Village, Lim Auwi and his family. Ahead is forty days, friends. When you drink your coffee in the morning, think of the Somau Garia people, without the Word in their language. When you eat your Christmas chocolates, dream His dream and see those people gathered around the throne, eyes fixed on Jesus. When you mix up a cake or bake cookies for your loved ones, remember our loved ones on the side of Mt. Somau. When you celebrate family during these remaining forty days, take your buoyant celebration before the throne of God and cry out for the people of God’s dream. As you pour out your love to friends and family over these forty days, remember us, too. Forty new financial partners. Forty new prayer partners. Forty special gifts for getting the Word out to the Somau Garia. Pray. Love. Give. Dream. Envision. To respond in some tangible way to this challenge, click here to visit Donate page on this website or click here drop us a note at prayer@shakethegates.org and let us know of your prayer commitment. August 11 (Day 1) — Sunday morning always brings with it a bit of anticipation. What will God do in our midst today? What will He show us through the Word and the Spirit to help us grow up in Him? Today marks the beginning of a season of prayer during which we are going to call on the name of the Lord, asking him to break through strongholds in heavenly places, shake the foundations of cultures, arrest the attention of people needing to walk with Him. Put on your spiritual armor today as you pray for the Aruamu people. Ask God to prepare hearts for the coming crusade. Ask God to turn their hearts toward Him in anticipation of this special time. Ask God to allow these people to acutely feel their deep, spiritual need.